While plenty of people are getting all very excited by the new Jaguar XE, this is of course not the first time Jaguar has launched a more compact model. In 2001 the X-Type came along. And three years into its life, an estate version was launched - the first ever estate car from Jaguar. 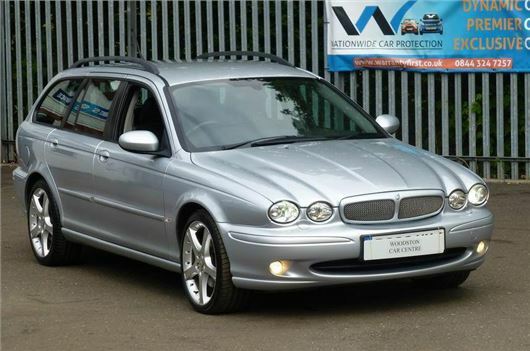 The X-Type also used a Ford diesel engine and that's what powers this good-looking X-Type 2.2D Sport that we found in the classifieds for under £5000. The 2.2-litre diesel engine has 155PS but it's the 360Nm of torque which makes it well suited to the X-Type Estate, meaning it has plenty of pulling power even if you're loaded to the gunnels. The 2.2D was introduced in September 2005 alongside the existing 2.0D - also a Ford engine. The 2.2D is the one to go for though as it's more refined and also came with extra sound proofing. The good thing about both engines is that they don't have a DPF - these were only fitted to as standard to facelifted 2.2D automatics from 2008. This car is a manual rather than an automatic and while the mileage of almost 85,000 miles isn't intergalactic, it's about average for what is a nine-year-old car. Those 18-inch alloys won't give you the most comfortable ride either. But that shouldn't put you off what looks like a very tidy X-Type. Being a Sport model this X-Type comes with a full leather interior which is in very good condition judging by the pictures and while the satellite navigation may seem dated now - both in terms of the mapping and the display - it's still a pretty good system. The paintwork looks tidy and even the boot carpet is in good nick. You also get plenty of kit for your money with heated and electrically adjustable seats, xenon headlights, folding mirrors and climate control. Plus of course parking sensors just to be on the safe side. With a full Jaguar service history this looks like it has been a well looked after car. As ever, there are a few things to look out for though. By early 2010, diesel pump failures were becoming more common on the diesel models and this can also damage the injectors. You also want to avoid any that have been used for towing as the 'official' removable towbars made by Brink were not factory fitted and connecting the electrics can be very problematic. But aside from that the X-Type has proved to be pretty trouble-free, going against the popular opinion that Jaguar cars are not usually reliable. So it's a good looking, comfortable and practical family estate with a touch of class. What's not to like? The X-Type may never have been the big success that Jaguar hoped for but it is now often an overlooked car, with most buyers after a premium estate going for the default BMW 3 Series Touring or Audi A4 Avant. But those people are missing out on what is a very underrated car and one that at £5k looks quite the bargain.